Evoke memories of San Francisco Bay with this beautiful representation made from layers of hand-cut paper. 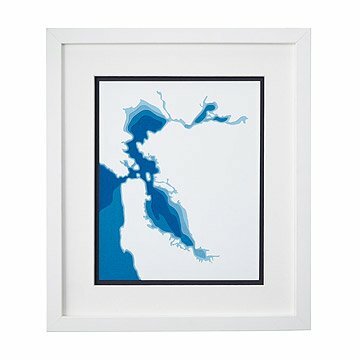 Relive memories spent by San Francisco Bay with this beautiful representation, made from layers of hand cut paper. Made by Marnie Karger, each unique topographic map showcases the depths of the water in bright blue hues. The layers create bold, three-dimensional intrigue, while the beautifully cut shorelines serve as a refreshing reminder of home. Handmade in Minnesota. Framed in Oregon. Marnie Karger is a Minnesota native who is continually inspired by the lakes and rivers that surround her. Equally fascinated by the geological history of her subjects as by the process involved in rendering them in paper, Marnie describes her work as the perfect marriage of her science-laden education, and her life-long love of art. Though trained as a teacher, Marnie has always loved working with her hands, and paper has been an easy and accessible medium. Her work, rendering lakes, rivers, coastlines, and topographies in layers of richly colored paper is the result of years of experiments, fully planned ideas, and happy accidents. She works in her home studio in Shorewood, MN, with a second-story view on the bucolic neighborhood outside. When she’s not working, she enjoys reading, hiking, canoeing, and spending time with her husband, their two clever daughters, and two goofy greyhounds. Keep away from direct sunlight and humidity.